Stony Brook, NY … March 14, 2019 … Two silver pieces created by prominent New York City artist Michael Galmer, whose works were displayed in Shaping Silver: Contemporary Metalsmithing at the Long Island Museum in Stony Brook last fall, will be added to the museum’s permanent collection. The works of art will be unveiled at a reception for the Galmers and invited guests on April 11 at 5:30 p.m. in the Visitors Center. The two hand-crafted pieces – a silver pitcher with a blossom design and Lust for Life (pictured), a 41-inch tall silver sculpture – add significantly to a small but growing selection of contemporary art in the Long Island Museum’s collection of mostly 19th and early to mid-20th century art and artifacts. The items will be on display in the Visitors Center through 2019. “The museum is so pleased with this significant gift. These objects add great depth to our growing contemporary collection,” said Neil Watson, Executive Director of the Long Island Museum. Michael Izrael Galmer immigrated to the United States in 1981 from the former Soviet Union where he held doctorates in physics and chemistry. A desire for free, creative expression drove him to the U.S. where he opened a studio in Astoria and made a living designing and selling fine, utilitarian silver pieces to notable companies such as Tiffany & Co., Lennox and Gorham. His design concept began from a desire to create something beautiful. Many of his works during this time incorporated flowers, animals and other motifs from nature. “When you go to the botanical garden, you love the flowers,” Galmer explained. 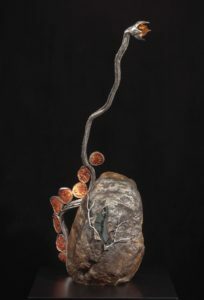 “It would be nice to take this home but you can’t take anything from the garden.” So he sought to create pieces that reminded his clients of certain experiences. Stony Brook, NY … January 10, 2019 … The Long Island Museum in Stony Brook announces the launch of a new outreach program designed for Long Island schools in districts that don’t otherwise have the opportunity to visit the museum. LIM on the Road, developed by Museum Educator Jessica Pastore, is an extension of the Long Island Museum’s on-site school programs, all of which follow the New York State curriculum standards in Art, Social Studies and/or Language Arts. Throughout the school year, the museum’s education department hosts more than 12,000 students from Long Island schools who come to the museum as part of traditional “field trips.” Noting that most of the participating students go to school in Suffolk County, Jessica, who lives in East Rockaway, said she was inspired to create LIM on the Road, when she realized the Long Island Museum is unknown to so many Nassau County residents, and schools in some underserved districts can’t afford the bus trip all the way to Stony Brook. “Most of my family had never heard of the Long Island Museum until I started working here,” commented Jessica. LIM on the Road offers two options for schools. Barnyard Dance, designed for younger students up to first grade, uses imagination and movement to explore how art and music teach us about history. Jessica totes photo enlargements – usually of William Sidney Mount paintings, (the Long Island Museum owns a large collection of the Stony Brook and Setauket native’s works) – costumes for dress-up, and tactile objects like those found in some of the paintings, which children can pass around and touch. The program lasts 45 minutes and costs $75 per class for two to four classes per day (maximum 25 students per class). School Days, modeled after the museum’s most popular school program, allows students in grades one through five to step back in time and experience what school was like in the 19th century. Jessica brings slate boards and slate pencils, dip pens and ink and guides the class through a discussion of the similarities and differences between school today and long ago. This program lasts one hour and costs $125 per class for two to four classes per day (maximum 30 students per class). Teachers interested in registering for LIM on the Road should call the Long Island Museum Education Department at (631) 751-0066 x212. Located at 1200 Route 25A in Stony Brook, the Long Island Museum is a Smithsonian Affiliate dedicated to enhancing the lives of adults and children with an understanding of Long Island’s rich history and diverse cultures. For more information about the Long Island Museum’s school programs or to schedule a field trip, visit longislandmuseum.org or call (631) 751-0066 x212. Stony Brook, NY … August 10, 2018 …The Long Island Museum in Stony Brook is proud to announce that Linda U. Margolin managing partner in the law firm MargolinBesunder LLP, has been named Chair of its Board of Trustees, succeeding Guy Germano, also an attorney, whose term was completed at the end of June. Margolin has been practicing law since 1975, concentrating her practice in the areas of land use and zoning, commercial litigation, and appeals. She served as law clerk to the Hon. Jacob Mishler, Chief Judge, U.S. District Court, Eastern District of New York from 1975 to 1976. She has an “AV” attorney rating from Martindale-Hubbell. 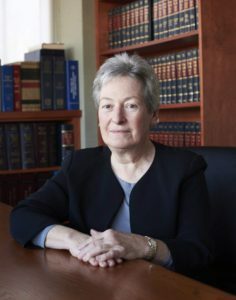 Margolin is an active member of the Suffolk County Bar Association; she has served as a director, and on the Federal Courts, Civil Rights, Appellate Practice, Judicial Screening, Nominating and Bench Bar Committees; she is also an active member of the New York State Bar Association, including the Commercial and Federal Litigation Section; past chair of the General Practice Section; present co-chair of the Land Use and Environmental Law Committee of the Real Property Section and member of the House of Delegates, and a Fellow of the New York Bar Foundation. She is also a member of the American Bar Association’s Litigation Section, and the Federal Bar Council. Since 2011, Ms. Margolin has served as a trustee of the Long Island Museum of Art, History and Carriages and she acts as pro bono counsel for the India Society of Stony Brook. She lives in Setauket with her husband Robert where she pursues sailing and gardening with equal fervor. Located at 1200 Route 25A in Stony Brook, The Long Island Museum is a Smithsonian Affiliate dedicated to enhancing the lives of adults and children with an understanding of Long Island’s rich history and diverse culrtures. The museum is open Thursday through Saturday from 10 a.m. to 5 p.m. and Sunday from noon to 5 p.m. For more information about how to support the museum, or to become a museum member, please call 631-751-0066 or visit www.longislandmuseum.org. Stony Brook, New York…August 3, 2017…The Long Island Museum announced today its award of a $40,000 grant from The National Endowment for the Humanities (NEH) to help fund A World Before Cars, the final phase of the LIM’s Carriage Museum revitalization project, begun in 2003. The Long Island Museum’s is one of 245 humanities projects in this round of funding, NEH’s third and last for fiscal year 2017. The total $39.3 million in total grants nationwide will support vital research, education, and public programs in the humanities. These peer-reviewed grants were awarded in addition to $46.1 million in annual operating support provided to the national network of state and local humanities councils during fiscal year 2017. A World Before Cars represents the latest phase of a major redesign of the LIM’s Carriage Museum, which contains one of the largest and finest holdings of horse-drawn vehicles and related transportation artifacts in the country. Utilizing the expertise of skilled consultants and the highly-regarded H. Lee Skolnick Architecture and Design Partnership, the LIM will plan an interpretive gallery composed of hands-on activity areas that explore the experiences of carriage riding/driving, the integral role of horses in 19th century America, and the ways in which carriage design innovations informed and influenced automobile design. From a ride simulation exercise to interactive computer kiosks and a comparative display of carriage and automobile parts, this new gallery will be designed to engage a variety of different visitor age and experience levels, providing an immersive entry into the world of carriages, and the unexpected ways in which they connect to our modern lives. Long Island Museum: Located at 1200 Route 25A in Stony Brook, the Long Island Museum is a Smithsonian Affiliate dedicated to enhancing the lives of adults and children with an understanding of Long Island’s rich history and diverse cultures. The museum is open Thursday through Saturday from 10 a.m. to 5 p.m. and Sunday, noon to 5 p.m. For more information visit longislandmuseum.org or call 631.751.0066. December 15, 2016 … Stony Brook, NY … The Long Island Museum announced today that its collections committee voted to approve the acquisition of an original oil painting artist Jane Wilson, who passed away early in 2015. The painting, titled Storm Light, was completed in 1993 and is a gift of Wilson’s estate. The Long Island Museum collections committee is composed of trustees and community advisors that meet three to four times annually to vote on new artwork and artifacts for the collection. According to Ruff, they were very excited to see the Wilson painting added to the collection. Storm Light is the fifth example of Wilson’s work to be added to the Long Island Museum’s collection. The Museum owns four additional Wilson paintings dating from 1955 to 2000. Other institutions that own her work include the Hirshhorn Museum, the Modern Museum of Art, the Smithsonian, and the Parrish Art Museum. Jane Wilson, who was a part-time resident of eastern Long Island since 1960, was an extremely talented painter who merged expressionism and realism, creating memorable landscapes known most for their dramatic horizons. After her passing early last year, she was the focus (along with fellow artist Jane Freilicher) of a major exhibition at the Parrish Art Museum. Storm Light will be highlighted as a new acquisition, on prominent display, when the museum opens its new season on February 24, 2017. Stony Brook, NY … October 12, 2016 … The Long Island Museum in Stony Brook bid bon voyage to William Sidney Mount’s painting, Catching Rabbits recently. The politically-themed painting is on loan to the Dixie Gallery & Gardens in Memphis, Tennessee as part of a new exhibition exploring hunting and fishing in art, opening October 23, 2016. As we are bombarded with political messages in this historically significant presidential election, we can stop and examine the ironically parallel politics of Mount’s day depicted in his painting. While the painting at first appears to be the triumphant illustration of two boys successfully trapping game, the underlying subject of Catching Rabbits is the contest between Democrats and Whigs in the 1840 presidential election. The boys in the painting represent the Whig party “trapping” votes, while the rabbit signifies the Democratic Party, weakened by internal division and subjected to desertion by its membership. Mount’s imagery proved so apt that the Democrats adopted the concept of the trap for their campaign broadsides, which cautioned against being lured and caught by the Whigs. The Memphis exhibition, Wild Spaces, Open Seasons: Hunting and Fishing in American Art celebrates artists’ captivation with hunting and fishing. It will be the first major art exhibition to explore the multifaceted meanings of such outdoor subjects in both painting and sculpture, ranging from the Colonial era to World War II. The exhibition encompasses a wide variety of portraits, landscapes, still lifes, and genre scenes, including iconic works by Thomas Cole, Thomas Eakins, and Winslow Homer, Alfred Jacob Miller, and Arthur Fitzwilliam Tait. In one important example after another, these representations of hunting and fishing do more than merely illustrate subsistence or diverting pastimes, they connect a dynamic and developing American nation to its past and its future. Located at 1200 Route 25A in Stony Brook, the Long Island Museum is a Smithsonian Affiliate dedicated to American history and art with a Long Island connection. The museum is open Thursday through Saturday from 10 a.m. and Sunday from noon to 5 p.m., and on specially selected days throughout the year. For information about other exhibitions and related programs, visit longislandmuseum.org or call (631) 751-0066. Stony Brook, NY … August 18, 2016 … The Long Island Museum in Stony Brook announced today that it is the proud recipient of a $15,000 grant from Bank of America. “The LIM greatly appreciates Bank of America’s most generous gift of support and is honored by the long-standing partnership Bank of America has shown to the museum throughout the years,” said Neil Watson, LIM Executive Director. The funding provided by Bank of America will support the museum’s compelling exhibitions, vital education programs, and engaging public events, including workshops, family festivals, lectures, musical performances, family book clubs, concerts and demonstrations. Bank of America invests in communities in order to advance local economies and create positive change. Support to organizations that provide critical services and programs is just one of the ways they help improve the quality of life in the communities they serve. The Bank of America Museums on Us program, in which the Long Island Museum is a participant, is part of its overall commitment to improving access to the arts through philanthropic giving, sponsorships and loans from their corporate art collection. Located at 1200 Route 25A in Stony Brook, the Long Island Museum is a Smithsonian affiliate dedicated to enriching the lives of adults and children with an understanding and appreciation of Long Island’s rich history and diverse cultures. For more information about the museum’s exhibitions and programs please call 631-751-0066 or visit www.longislandmuseum.org. At Bank of America, our focus on Environmental, Social and Governance (ESG) factors is critical to fulfilling our purpose of helping make people’s financial lives better. Our commitment to growing our business responsibly is embedded in every aspect of our company. It is demonstrated in the inclusive and supportive workplace we create for our employees, the responsible products and services we offer our customers, and the impact we help create around the world in helping local economies thrive. An important part of this work is forming strong partnerships across sectors – including community and environmental advocate groups, as well as non-profits – in order to bring together our collective networks and expertise to achieve greater impact. Learn more at www.bankofamerica.com/about and follow us on Twitter at @BofA_News. Stony Brook, NY … May 25, 2016 … The Long Island Museum announces the naming of its 10,000 piece textile collection in honor of Mary and Philip Hulitar. Mary Hulitar has generously donated $500,000 to the LIM as a leadership gift to preserve, digitally archive, and exhibit the Mary & Philip Hulitar Textile Collection. Mary Gerstenberg Hulitar has been a longstanding donor to the museum since 1987. Formerly a long-time resident of the Three Village area, her father was a key player in LIM’s early history. The LIM’s Dr. Charles W. Gerstenberg Carriage Reference Library is named for him and is an invaluable research resource for transportation scholars and curators. She is the widow of Philip Hulitar, a prominent and gifted women’s fashion designer in the 1950s and 60s, as well as a long-time patron of the arts. “I put two things together, my husband’s career and my life on Long Island—that angel place for me—when making the decision,” Mrs. Hulitar said from her home in Palm Beach. The LIM’s textile holdings maintain a key position as one of the museum’s core collections. The collection includes an outstanding set of historic costumes, quilts, shoes, and other textiles from the 18th century to the present, including a c. 1955 dress and matching jacket designed by Philip Hulitar for Bergdorf Goodman. “He was a brilliant influence as head designer for Bergdorf Goodman and this really exquisitely embroidered silk dress is our most beautiful mid-century gown,” said Chief Curator Joshua Ruff. Mrs. Hulitar’s gift will be used for the museum’s ongoing work of cataloguing, conserving and researching the Mary & Philip Hulitar Textile Collection to ensure these irreplaceable pieces will be preserved for future generations. The museum will strive to add works to the collection designed by Philip Hulitar and also continue to expand his reputation to the field of fashion design and to the broader general public. In addition, the museum plans to invest in new, modern storage and display materials for the costumes. Stony Brook, NY … April 14, 2016 … The Long Island Museum and the Setauket Presbyterian Church announced today that they are among the very grateful beneficiaries of a landmark gift, a $100 million charitable trust from the Kingsley Gillespie Charitable Trust, Bank of America N.A, Trustee. This gift continues the Kingsley and Kenyon Gillespie families’ lifelong legacy of philanthropy to the Three Village Community, as well as their commitment to the arts, community service and faith. Other beneficiaries of the charitable trust include MIT, Stamford Hospital in Stamford Connecticut, The Rotary Club of Stamford and the First Presbyterian Church of Stamford. Every year, the charities will receive the income earned by the trust. The Long Island Museum will receive 10% of the income from the $100 million trust. This bequest is one of the most significant gifts in the museum’s 77 year history. “The Board of Trustees and the museum’s staff are overwhelmed by the Gillespies’ generosity. This tremendous gift strengthens the LIM’s existing endowments and solidifies the museum’s financial foundation. We are forever indebted to the Gillespie family for their foresight and their belief in the importance of the LIM and its place as a cultural leader in our community,” stated Neil Watson, LIM’s Executive Director. The Gillespie Meeting Room, located on the upper level of the Carriage Museum at the Long Island Museum is commemorated in memory of Doris and Kingsley Gillespie. It includes a stage and seating for approximately 125 people. The room provides space for lectures, music concerts, seminars, exhibits and other special events, a lasting tribute to Mr. and Mrs. Gillespie’s interests and the family’s professional ties to the field of communication. Doris Kenyon was born in 1900 in Brooklyn, but as a child spent her summers in Old Field. In the 1930s, Old Field became her year-round home. She had a lifelong affection for the Three Village area and it is appropriate that a part of the Carriage Museum is commemorated in her name. She was married to Kingsley Gillespie, a graduate of the Massachusetts Institute of Technology, who had begun his career as plant manager and research director of the Stamford Rubber Supply Company. In 1941 he made a career change, becoming publisher of a Connecticut newspaper, The Advocate of Stamford. In 1957 he also became publisher of the Greenwich Time. Mr. Gillespie was a former owner of Stamford radio station WSTC. The Gillespies maintained homes in Stamford and Old Field and were involved in community activities in both areas. They were generous benefactors. In retirement years, they were able to spend more time at their Naples, Florida home. Mrs. Gillespie is remembered fondly for her love of animals and her interest in riding. Neighbors saw her often on the roads of Old Field as she rode horses, a pony, and even a dog cart. Mr. and Mrs. Gillespie both died at their Florida residence, he in 1984 and she in 1986. A daughter, Joan, a United States Foreign Service officer, died in Tunisia in 1959. Their son Kenyon died in March of 2015. Located at 1200 Route 25A in Stony Brook, the Long Island Museum is a Smithsonian affiliate, dedicated to enhancing the lives of adults and children with an understanding and appreciation of Long Island’s rich history and diverse culture. For information about the museum’s world-class exhibitions and New York State chartered education programs visit longislandmuseum.org. Founded in 1660, the Setauket Presbyterian Church is a living, inclusive, and active faith community of around 500 people. It has a history of social engagement: some of its members were leaders in George Washington’s spy ring during the Revolutionary War. The current building dates from 1812, at 5 Caroline Avenue on the Setauket Village Green. Today the church has strong worship and preaching, programs for children and youth, a large, diverse, and vigorous peace and justice ministry, a twenty-two year relationship with a sister church in Cuba, and has recently founded Open Door Exchange, connecting families in need with free, good-quality donated furniture.